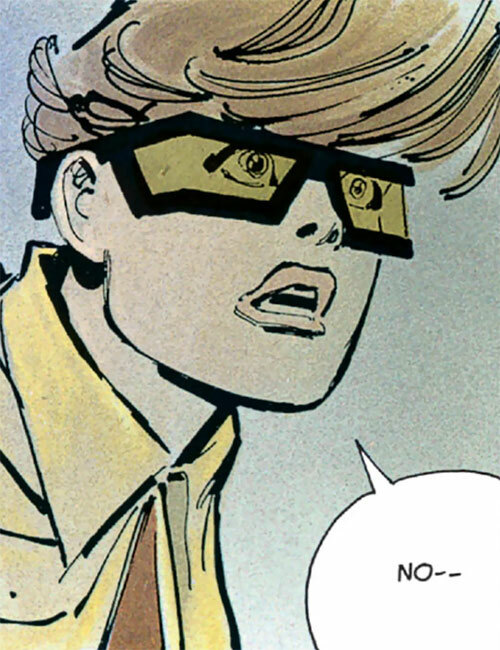 Carrie Kelley is Batman’s Robin in a specific future timeline. 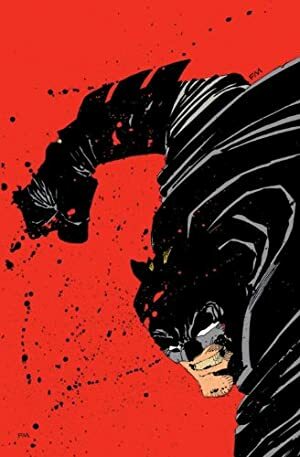 This future was chronicled in Frank Miller’s The Dark Knight Returns, a landmark and highly influential graphic novel published in 1986. Carrie later continues her adventures as Catgirl. 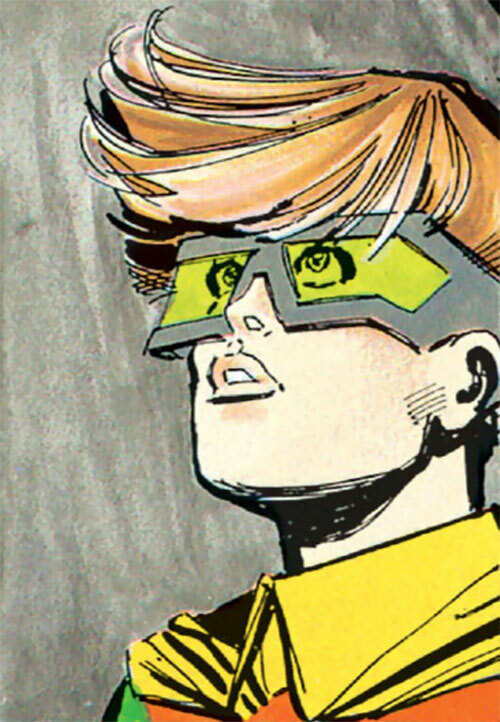 Real Name: Caroline “Carrie” Kelley. 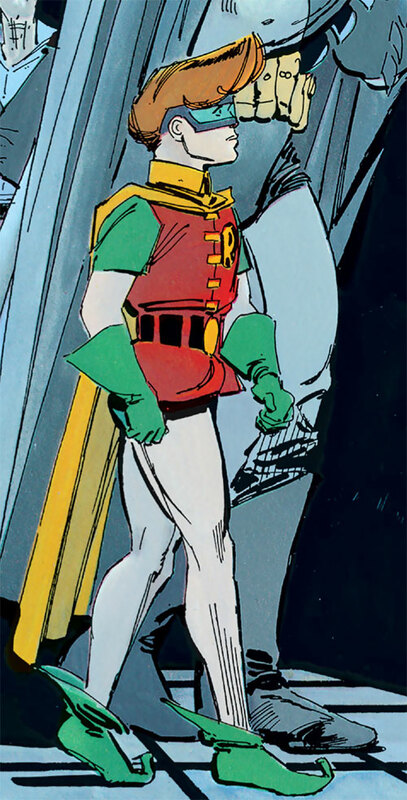 Other Aliases: “Boy Wonder”, “Chick”. Known Relatives: Parents (names unrevealed). Group Affiliation: Partner of Batman (Bruce Wayne). Height: 4’9″ Weight: 78 lbs. Eyes: Brown Hair: Strawberry blonde. Note: Kelley’s stature is difficult to estimate with the stylised art, but the intent seems that she’s unusually short for her age. We have opted for numbers that make her smaller than 90% of 13-year old girls. Girl Scout experience that includes a remarkable amount of first aid training. For instance, Caroline is capable of setting broken bones and staunching major blood loss. A cinematic level of competence with computers, including hacking them. An amazing level of agility, hand-eye coordination and fitness (especially for her age, but she’s far superior to the vast majority of adults in these areas). Caroline is also one unusually lucky lass, with a talent for narrowly avoiding dangers such as fatal falls (in DC Heroes RPG terms, the Luck Advantage). She also learns new skills extremely quickly. As the stories unfold, young Ms. Kelley starts training with Batman. In particular she improves her acrobatics and accuracy with projectile weapons. She is also taught the basics of undercover work. She further knows how to operate Bat-vehicles but this is done through voice commands rather than real controls. Being minuscule, Carrie is not yet suited for offensive melee combat and has no training with such. Rather than a combat asset she works as a scout/infiltration/intelligence asset, driver/pilot and support. Her only “weapon” is a slingshot, which is chiefly useful to distract people by plinking them in the forehead with a small rock. And even that will not work against people with good pain tolerance. Carrie often operates the Bat-copter, a helicopter gunship that looks like a mishmash of Apache and Hind. It is heavily armoured and armed, has a full cloak, and is packed by sophisticated computers. The onboard AI can fully interpret Carrie’s vocal orders, and carry them out with pinpoint precision. Caroline Kelley exists in an alternate future timeline of the DC Universe. In this possible future, various issues bedevilling the USA of the 1980s have continued to run unchecked. This results in a mediocre, somewhat lawless, chaotic, decadent setting. In this future (year unspecified), Batman retired ten years ago. Gotham, as usual, is doing even worse than the rest of the country. Criminality is omnipresent, and the powerful street gang The Mutants controls many streets at night. By this point, Caroline Kelley is a diminutive 13-year old student. She’s largely raising herself. Her parents, who apparently used to be activists, are now complete burnouts and stoners spending their days in front of the telly. As they take a shortcut, she and her best friend Michelle are ambushed by three Mutants gangbangers. However, the middle-aged Batman has just resumed his clandestine activities and swoops in, mauling all assaillants. The two girls, being too young to know about Batman, describe him as “a huge man dressed as Dracula”. Though he’s very near retirement, Commissioner Gordon then decides to resume working with Batman against tremendous political pressure. Fascinated by Batman, Carrie sees the Bat-Signal over Gotham one night. She decides to become the new Robin and find Batman. After saving two weeks’ worth of lunch money, Ms. Kelley buys a Robin costume and starts experimenting with urban acrobatics. She nearly kills herself several times, but eventually develops genuine proficiency in gamboling over the rooftops. As “Robin” starts disrupting very minor street crimes (such as rigged three-card monte), she hears about a major meeting of The Mutants. Something this big could cause the Batman to show up. Carrie sneaks in to observe the meeting, and Batman does barge in, dispersing the heavily-armed gang. However, Batman is overpowered by the nigh-inhuman leader of The Mutants. 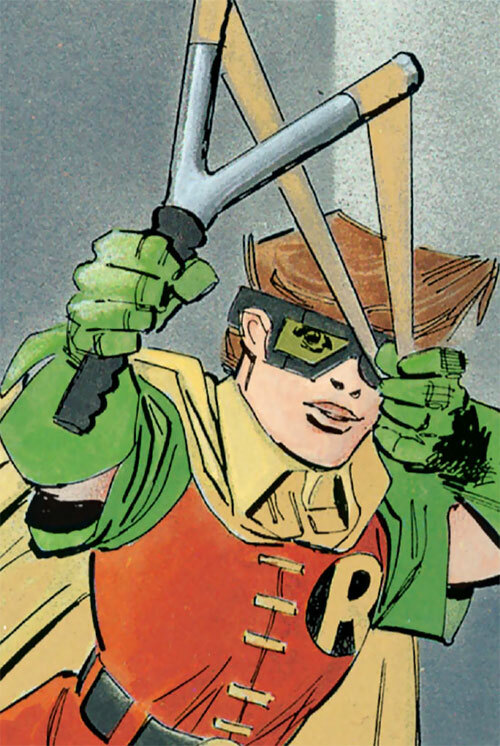 ”Robin” rushes in, which saves his life. The lass then evacuates him in the Batmobile as Alfred Pennyworth guides her over the radio. Batman impulsively decides to take her into the Batcave, and make her the new Robin. Disguised as a Mutant and pretending to be a massively underage concubine of the leader, Robin spreads a false rumour about another major Mutants meet. This works, and the assembled bangers thus see Batman clearly defeat and maim their leader. As a result, many Mutants splinter off. They form a chaotic militia called the Sons of Batman. A handful of former Mutants splinter off as Nazi fetishists. As this crew is committing an armed robbery, Batman and Robin intervene. However, Carrie disobeys Batman’s order not to engage, which nearly kills them both. Later on she again disobeys out of excitement, setting off a bomb left behind by the Joker. The charge destroys an entire building, though Batman narrowly gets Robin out in time. 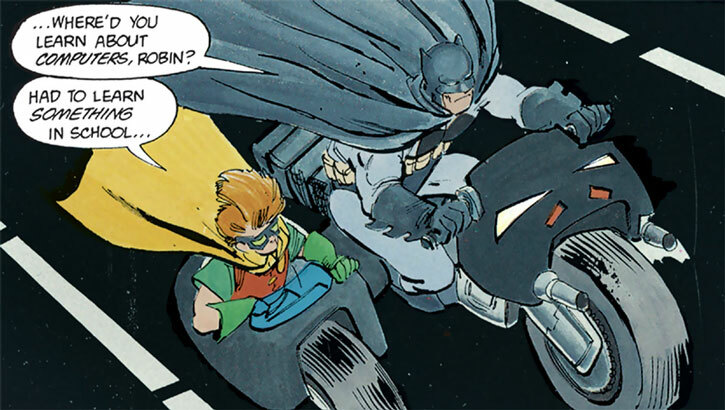 Robin is sent home, but Batman eventually sends for her to join him. He is preparing to confront the Joker once and for all. He will also have to face the GCPD, as the new Commissioner wants the vigilantes behind bars. Robin once again disobeys orders, as she hacks and reprograms Batman’s helicopter. This allows her to rescue her boss, who was losing his fight with the cops. As Batman starts giving Robin more leeway, the dynamic duo determines where the Joker is going to strike at the county fair. By the time they get there the carnage has already started, to Carrie’s shock. As Batman chases and half-contains the Joker, Robin engages the madman’s accomplice. She narrowly disarms him, but he easily overwhelms her in close combat. In the fray, Robin’s enemy is accidentally decapitated, to her further shock. As Batman calls for backup, Robin collects herself. She uses the Batcopter to disperse the SWAT teams and evacuate the wounded Batman. Back at the Batcave, she assists Alfred as he treats Bruce’s wounds. The East Coast of the US is hit by an EMP as World War Three nearly starts. Batman and Robin intervene on horseback, rallying the police, civilians and the Sons of Batman to organise and weather the catastrophe. After Robin assists Batman in his last clash with the sellout Superman, she joins Bruce Wayne’s underground militia. The diminutive Carrie has her hair done in what seems to be a trendy style – an odd mix of pompadour and fringe. She also wears fashionable street clothing of the day, slightly oversized for her and with a high collar on her jacket. 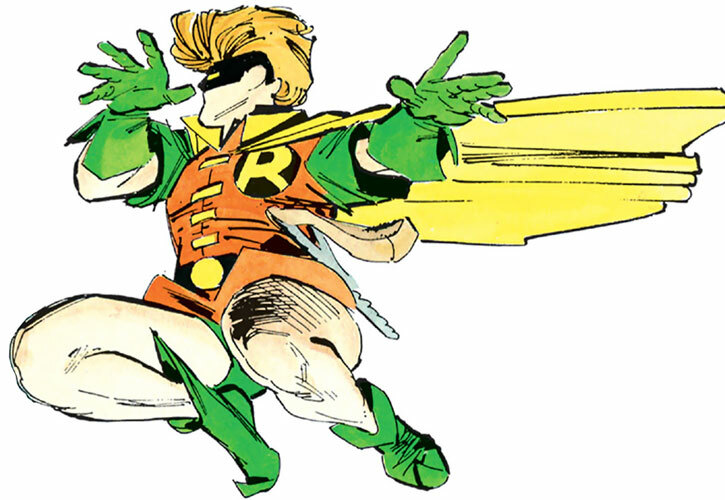 The Robin costume is the traditional pixie boots one. 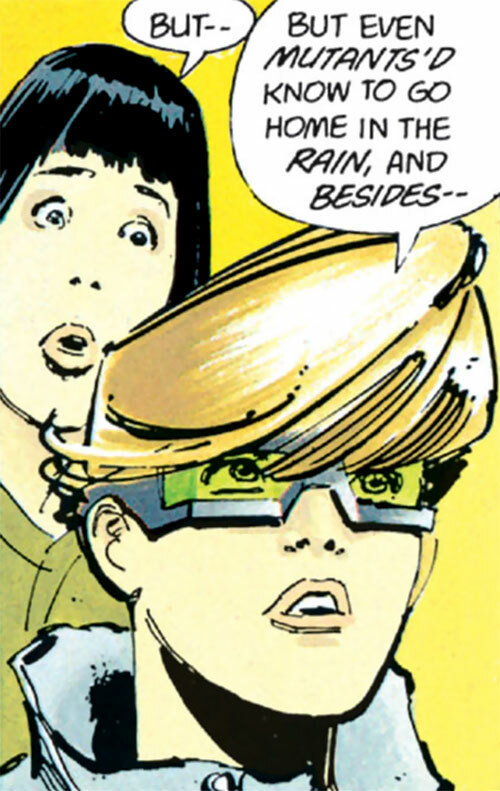 But instead of a mask she wears large tinted goggles with a heavy frame, which she also sports in her civilian identity. The tint varies – yellow, green, blue, etc. Caroline speaks in part in imaginary future street lingo, but speaks old people English with Bruce. More or less. Caroline was initially aimless and looking for an indeterminate something while bored at school. Though for some older kids it was joining the Mutants, Batman was her thing. Albeit she’s otherwise disciplined, Carrie is terribly eager to help, sometimes foolishly so. At the same time she has a knack for reading Batman, and never pushed past the line where she would genuinely get fired. Overall, they work very well together. 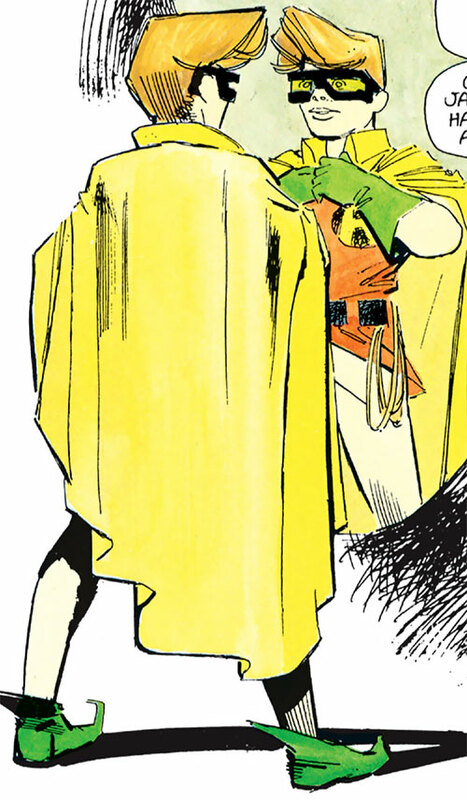 Like most, Robin is awed by the immensely charismatic Batman. She treats him like a cross between a father figure and a dragon. At the same time, she doesn’t really respect his old-fashioned, sort-of-parental authority. At the end of the day, Robin is doing what she thinks is right and learning her own lessons. Superspeed only for Mental Tasks, and is only applicable when either learning new skills/lore or using Scientist (Computers). Luck, Financial Backer (Mr. Wayne). Batman (High), Green Arrow (Low). Age (Young), Mistrust, Secret Identity, Misc. : body mass is 1 AP. TINTED GOGGLES [BODY 02, Shade: 02]. Firecrackers [no game effects, but they make noise and cause distraction]. De-cel lines (which can quickly double as a lasso) and grappling hooks. REMOTE CONTROL WRIST UNIT [BODY 02, Radio communications: 07. Radio coms only to issue orders to bat-vehicles, who will interpret those with their AI (but can also remotely locate the WRIST UNIT)]. One suspects that her “R” symbol over her heart is armoured. Caroline often operates the BAT-COPTER [STR 08 BODY (Hardened) 09, Flight: 08, Invisibility: 03, Radar Sense: 19, Thief (Stealth): 06, Vehicles (Self): 05. Note: Thief applies both against noise (but not the downwash) and radar detection, Thief only applies up to 07 APs of Flight (the last AP is done via rocket boosters)]. It is armed with a chaingun [Projectile weapons: 10, AV 05] and what seems to be laser-directed free-flight rockets [Projectile weapons: 11 Combined with Bomb: 06, AV 05]. Carrie’s Acrobatics rapidly increases as the story progresses. It starts Unskilled. The listed APs are for the very end of the story, she’d be at 04 during the early stages of the story. Likewise Animal Handling appears late in the story, and would be Unskilled before that. It is likely she learns the Vehicles Skill soon after the story ends. Most other Skills of hers are an AP lower during the first half of the story. We assume that the majority of Hero Points she used were supplied by Batman via Leadership. – Shrinking 1 (Permanent, Innate… well, until she grows up). – Quickness 1 (Limited 2 to learning new skills and lore). – Called shot between the eyes — Ranged Affliction 2 (Dazed, Stunned) (Instant Recovery, Limited degree), Linked with Ranged blunt Damage -2 (Feature: Range is considered to have 2 Ranks rather than -2). – Radio communicator with bat-vehicles — Radio communication 2, Limited 1 to bat-vehicles. – Enhanced Advantage (Ultimate Toughness) (Limited 1 to sharp impact). – Enhanced Advantage (Second chance) (Sharp Impact). Accurate attack, Close Attack 1, Defensive Roll 1, Ranged attack 2. Beginner’s Luck, Equipment 1, Luck 1. Acrobatics 7 (+11), Athletics 9 (+7), Close combat (Unarmed) 1 (+4), Deception 4 (+5), Expertise (Computers) 8 (+11), Expertise (Equestrienne) 2 (+5), Insight 3 (+4), Perception 4 (+5), Ranged combat (Slingshot, lasso) 2 (+6), Treatment 2 (+5) (Limited 2 (Limited to Revive and Stabilise)), Stealth 1 (+6). Tinted goggles Second chance (Bright lights) ● 1 point. Firecrackers Used for diversion ● 1 point. De-cel lines and grappling hooks ● 1 point. De-cel line used as a lasso Move Object 1 (Limited Direction) ● 1 point. Slingshot Blunt Damage -2, Range about 60 feet ● 1 point. Slingshot +6, Range 60ft, Damage -2 plus the possibility of an Affliction from “Go for the eyes boo”. Lunch money Carrie’s budget is at best lunch money, but this is only a problem if she can’t reach Bruce Wayne. Sweet child in time Carrie is obviously a minor, and she’s small even for her age. Wolverines! 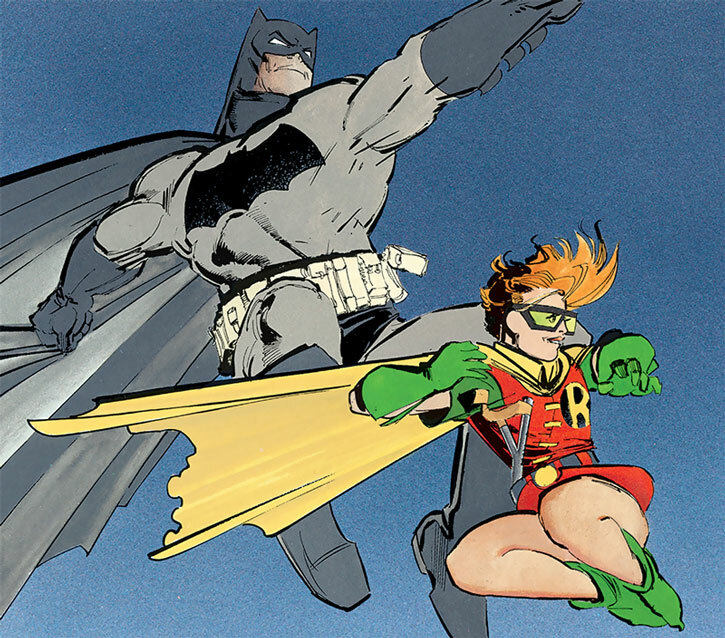 Robin’s activities are illegal, and she and Batman are hunted by the police and government. Undercover agent Robin frequently conducts high-risk undercover missions. Trade-off areas. Attack/Effect PL 2, Dodge/Toughness PL 6, Parry/Toughness PL 3, Fort/Will PL 2. Points total 72. Abilities 24, Defences 11, Skills 21, Powers 4, Devices 4, Advantages 8. Equiv. PL 5. By Ethan Roe and Sébastien Andrivet. Source of Character: Dark Knight Returns (1986 GN). Helper(s): Capita_Senyera, Darci, Frank Murdock, William Chamberlin, Pufnstuff. Writeup completed on the 1st of November, 2016.